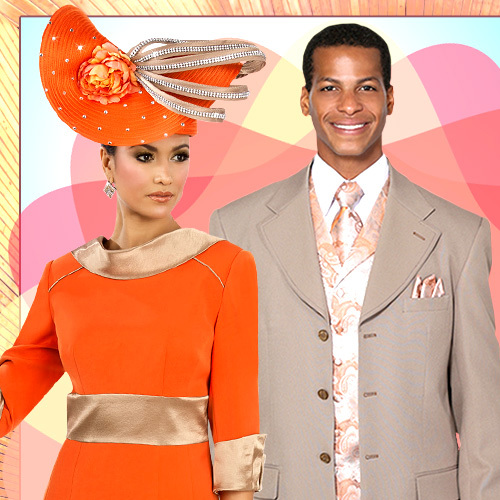 Donna Vinci, the premier couture designer for women's church suits, knit suits and one-of-a-kind-hats, is proud to announce its 35th anniversary of dressing women for all special occasions. Donna Vinci's novelty fabrics, unique stying and custom fit, allows a woman to own such an exclusive outfit. 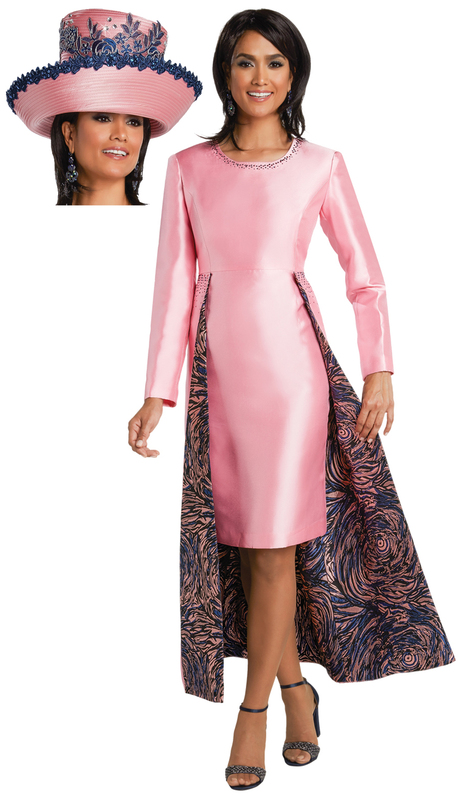 We hear again and often, our ladies proclaim, "No one looks like me in my Donna Vinci Suit". One Piece Flounce Dress In Embroidered Novelty Fabric With Rhinestones & Pearls. One Piece Embroidered Dress With Cascading Over The Shoulder Collar. 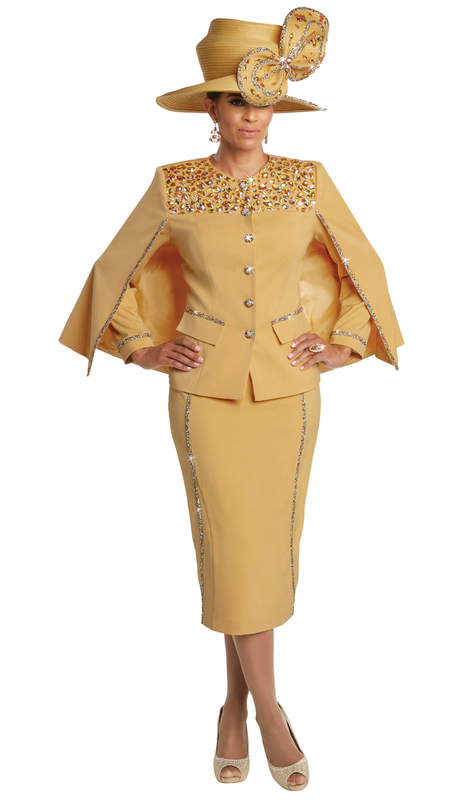 Three Piece Skirt Suit, Exclusive Novelty & Silk Look Fabrics With Rhinestone Buckle and Brooch. 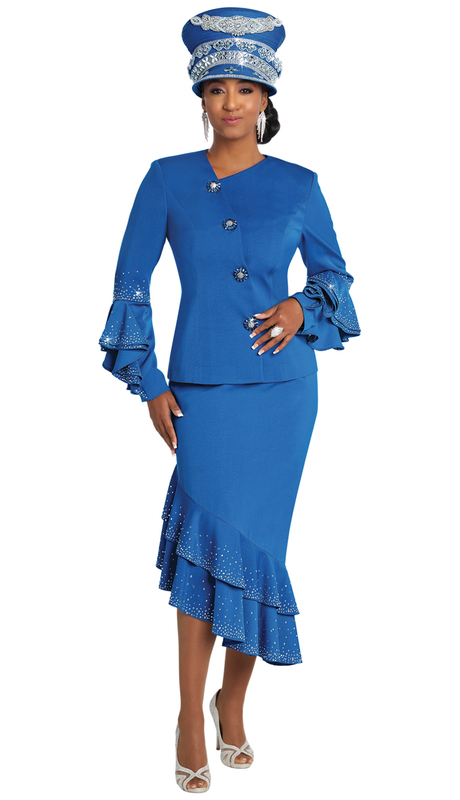 Three Piece Womens Church Suit With Ruffle Collar Jacket. Two Piece Dress And Printed Jacket With Rhinestone Trim. Two Piece Sleeveless Dress Set With Longsleeve Floral Lace Jacket. 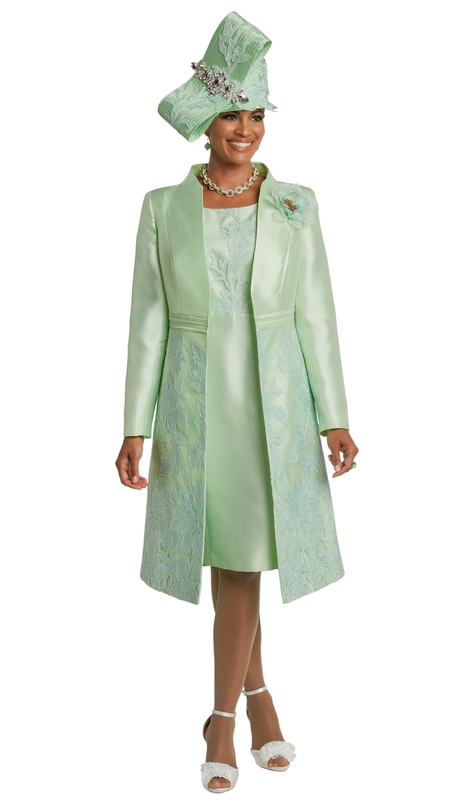 Two Piece Silk Look Dress With Guipure Lace & Organza Ruffled Jacket. One Piece Silk Look Dress With Novelty Lace Wide Sleeves. One Piece Jewel Embellished Flared Dress With Fringe Cuffs. 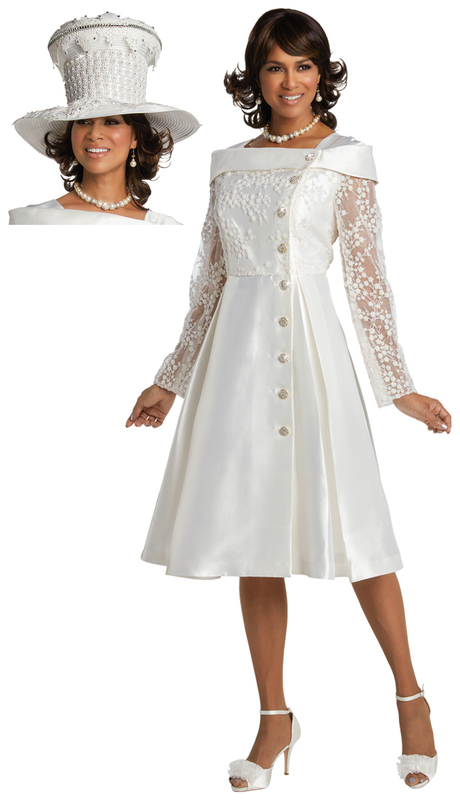 Two Piece Silk Look Church Dress With Embroidered Gold Novelty Lace Design Jacket. Two Piece Dress Set With Scalloped Trim Style. One Piece Lace Sleeve Pleated Dress With Portrait Style Collar. 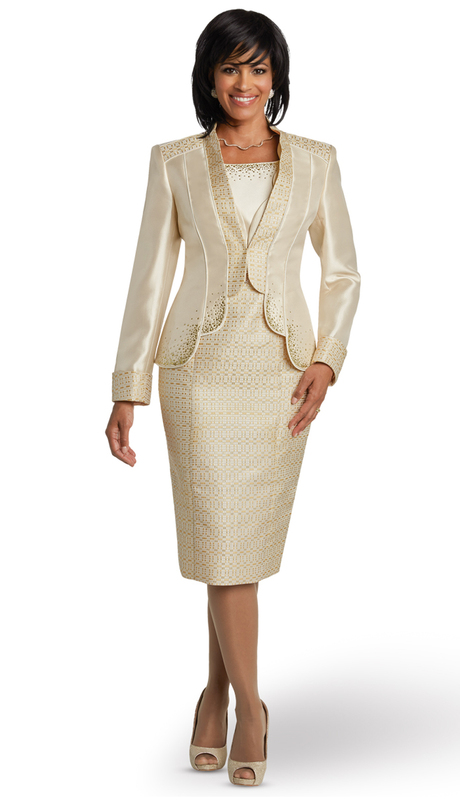 Three Piece Tulip Flounce Skirt Suit With Chevron Pleats And Pearl Trim Vest. Three Piece Skirt Suit With Floral Applique Design. 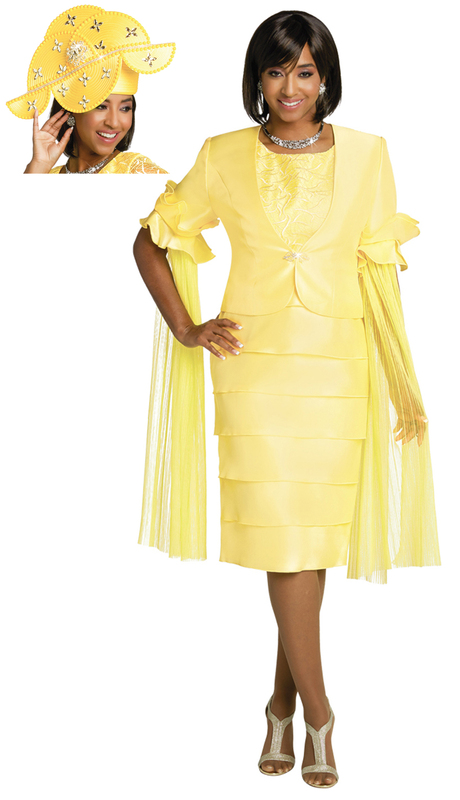 Two Piece Capelet Jacket & Silk Look Flared Skirt Suit With Iridescent Glitter Mesh Design. Two Piece Dress & Jacket Set With Embroidered Lace Design. 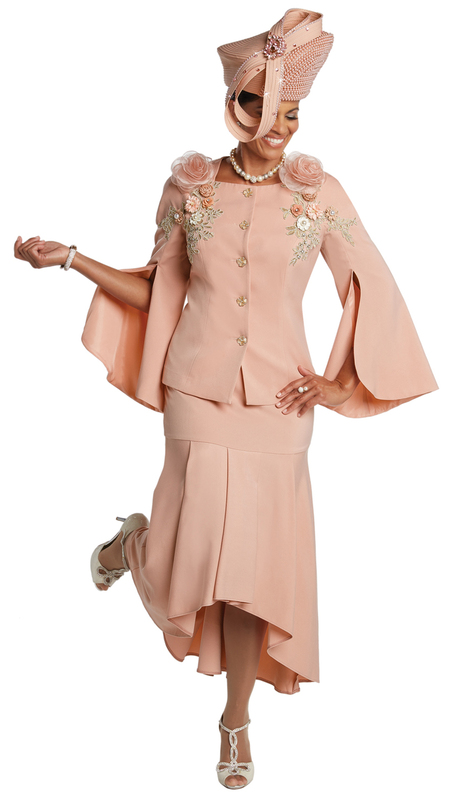 Two Piece Peach Skin Church Suit With Rhinestone Trimmed Skirt & Capulet Jacket. Two Piece Womens Two Piece Suit With Floral Applique And Split Bell Cuffs. 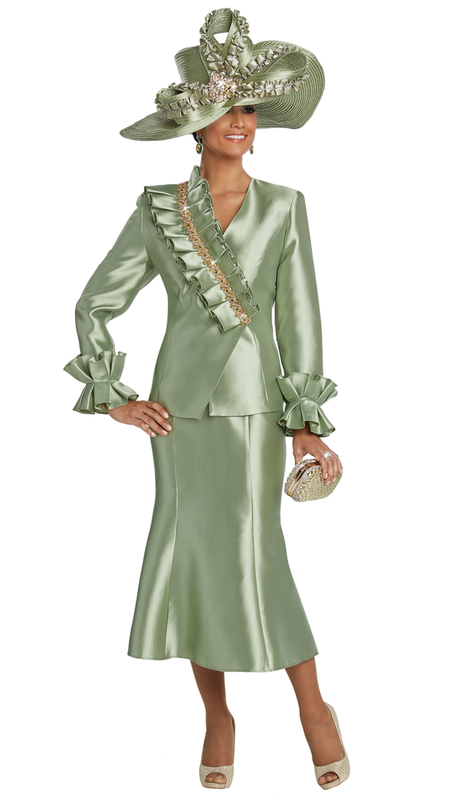 Two Piece Silk Look Pleated Flounce Hem Skirt Suit With Satin Trim Ruffled Jacket. 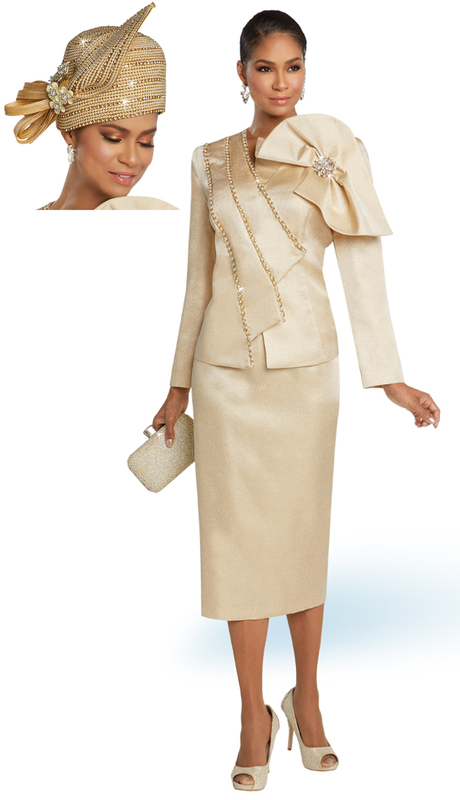 Two Piece Tiered Effect Dress With Pleated Tuling Sleeve Jacket. Two Piece Angled Layer Flounce Skirt Suit With Rhinestone Embellishments. One Piece Ladies Capelet Dress With Lace Sleeves. One Piece Solid Dress With Printed Waist Cape. Two Piece Skirt Set With Bow On Asymmetric Design Jacket. Two Piece Dress Set With Printed Asymmetric Design Jacket. Two Piece Flared Skirt Suit With Over Shoulder Embellished Ruffle Trim. One Piece Peach Skin Dress With Colored Rhinestone Neckline. One Piece Peach Skin Cape Design Dress With Rhinestone Trims. Two Piece Dress Set With Lace & Mesh Design Jacket. 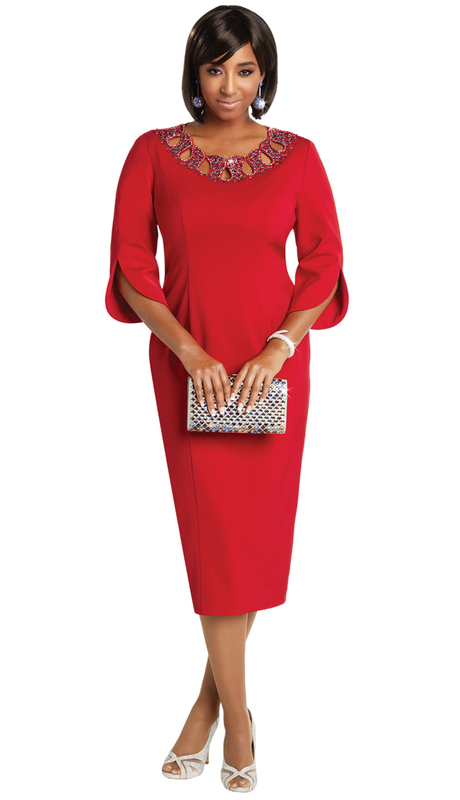 Two Piece Dress Set With Textured Look And Bell Cuffs. Two Piece Dress Set With Floral Embroidered Applique. 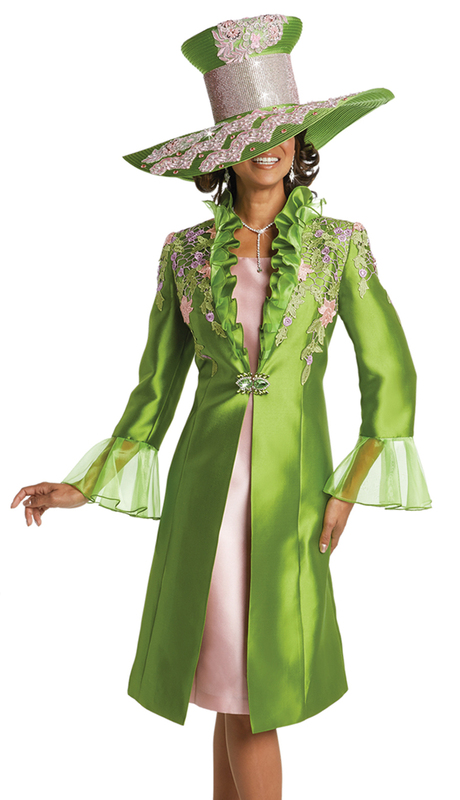 One Piece Sermon Robe In Crepe de Chine Fabric With Guipre Lace & Rhinestone Pearl Trim. 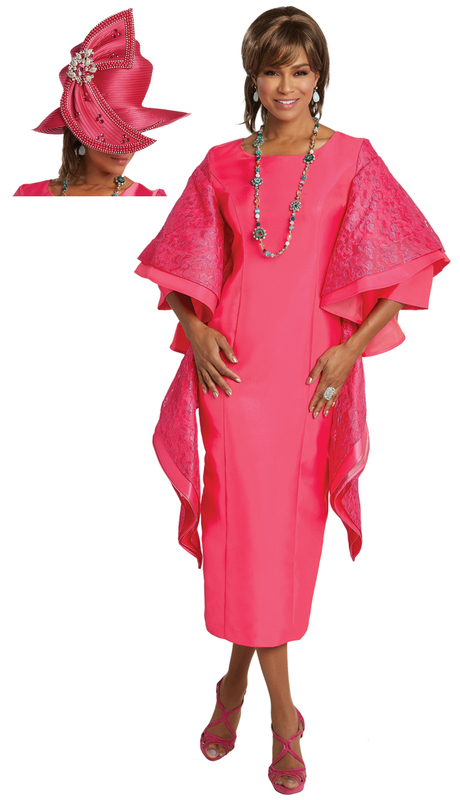 One Piece Sermon Robe In Crepe de Chine Fabric With Rhinestone & Beaded Trim. 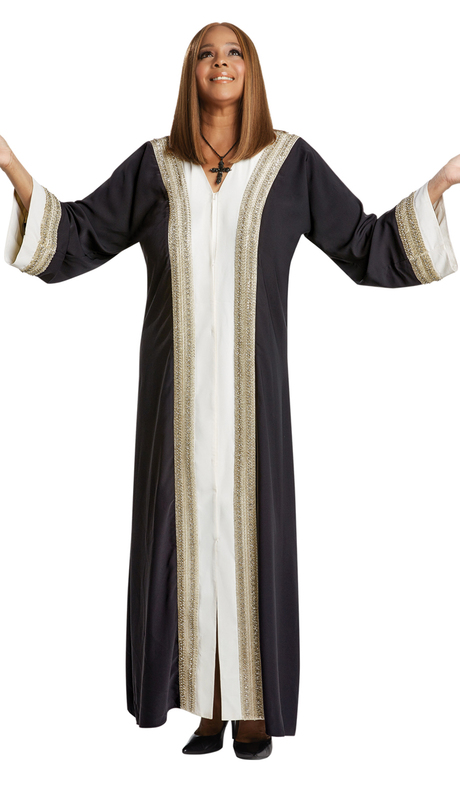 One Piece Womens Sermon Robe In Crepe de Chine Fabric With Novelty Sequin And Bead Trim.